This story was first published in the Japanese magazine, Flyfisher. 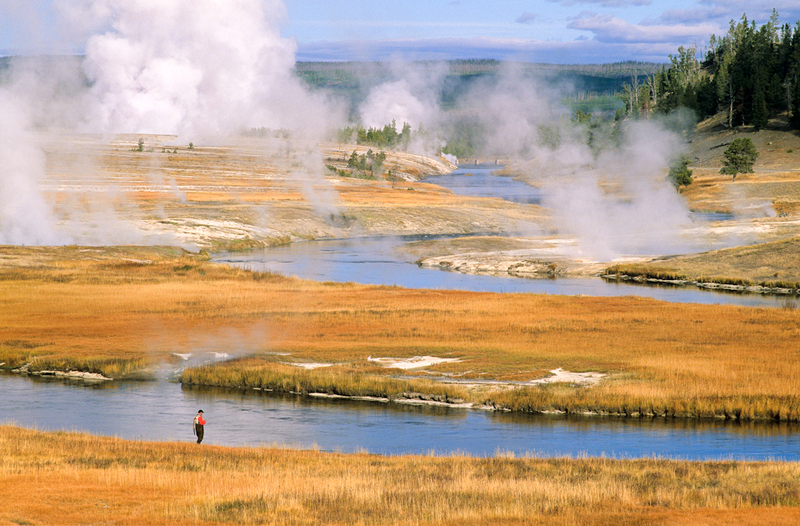 In the angular light of a late October afternoon I have made my way to the banks of the Firehole River, Yellowstone National Park’s iconic trout stream. October is a time of quiet in the Park and today is no exception. I am virtually alone on the river. The buses carrying the tourists of summer vanished weeks ago, and few fishermen are left, too. 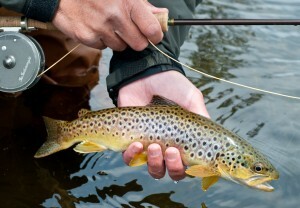 Those that do remain mostly ply their wares on the Madison for fall-run brown trout. I’ve come to the Firehole hoping to fish a Baetis hatch and, as I walk the edge of Muleshoe Bend, I see that I won’t be disappointed. Good numbers of tiny duns ride the placid flow, drifting quietly as they dry their wings. Trout feed steadily; rainbows in tightly-knit pods of a dozen or so fish, and solitary browns that wrinkle the surface along protected banks. The rising trout quicken my pulse, and I string my rod with anticipation. There is no wind—a rarity for an October day—but plenty of sunshine. While Baetis often prefer emerging in overcast, rainy or snowy weather (conditions more typical of late autumn in Yellowstone), nice days do not necessarily preclude good hatches. And with nice days a scarce commodity this time of year, I hold each one dear, hatch or not. The bright sunlight warms my hands and face, but makes the trout skittish. Though they feed eagerly on the naturals, even minor casting and wading mistakes cause them to spook. The river’s tricky currents make for challenging drifts; a long leader and 6x tippet are essential. If not for the thick weedbeds to which many fish scurry when hooked, 7x would be a better choice. 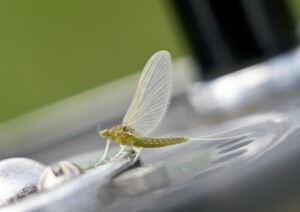 Imitating the pale gray mayflies with a tiny Sparkle Dun, I fish for several hours. Probing the pods of risers, I hook and land fat rainbows—strong-willed, handsome trout that bolt from my hands when released. Along the outside bend of the river I stalk bank-feeding brown trout. These are the larger fish, and they prove difficult to take. Since they won’t surrender the security of the bank, my presentations must be accurate and precise. With just a few inches for error, this fishing will severely test an angler’s casting ability. I misjudge many of my casts (scaring the fish badly) but get lucky enough to hook and land a couple furtive Firehole browns. And a couple is plenty; as I cradle the fish in my hands and marvel at their beauty, I quickly forget about the fish I spooked. As always, the afternoon proves ephemeral and too soon the sun drops behind the treeline. Shadows lengthen, the temperature falls precipitously, and suddenly the hatch is over. I climb out from the river, clip off my fly, and reel up. Walking back to the car I cast a fleeting look behind me to see that, like the rest of the Park, the Firehole is quiet now too.